I really miss pancakes. Seems an odd thing to say. I do though. This morning Jamie got up to go to work and she asked if I would make her some pancakes. No problem. I make a pretty awesome stack of banana pancakes. Extra eggs, lots of bananas, a bit of honey, some Bisquick, and milk. I must also say that I couldn't resist having a few. It's been so long and I felt comfortable having a few small pancakes for breakfast. They were mostly eggs and bananas so what real harm could come? I certainly didn't gorge myself on pancakes. If it's one thing that I think I'm learning - it's moderation. Slowly but surely I'm figuring out how to stop eating when I don't feel hungry any longer. I don't have to finish everything on my plate. I can always save food for the next meal. If I can keep just that one thing going then I will be in much better shape - no matter what the food. After dropping Jamie off I checked my killie traps and they were full. I took a load of them home in a bucket and decided to give fishing another try. The kids down the street (Alex and Anna) were home and because they had been asking me to take them fishing for a few days now, I decided to invite them along. 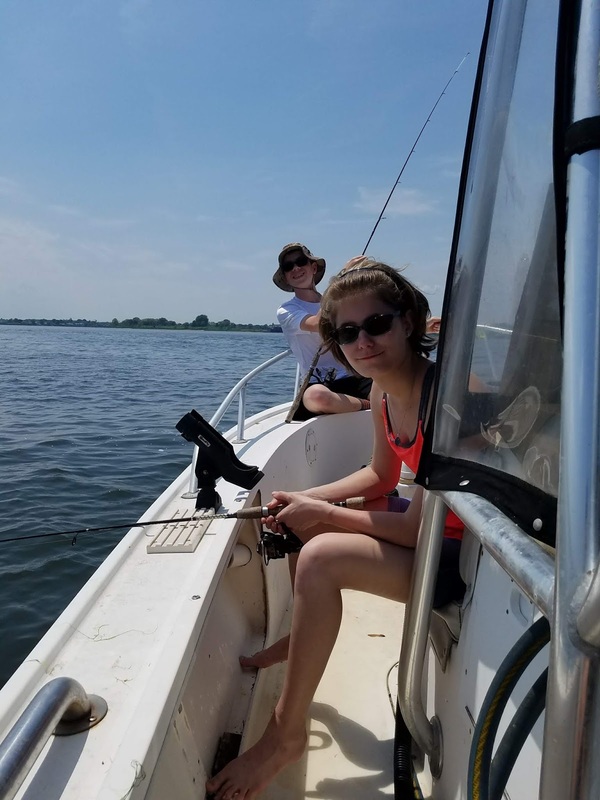 I love teaching kids how to fish - especially when they are enthusiastic about learning. These kids followed direction well and had a wonderful time. I let them drive the boat a lot - always fun for a kid to take the steering wheel - and they loved it. First and Second Mates today! 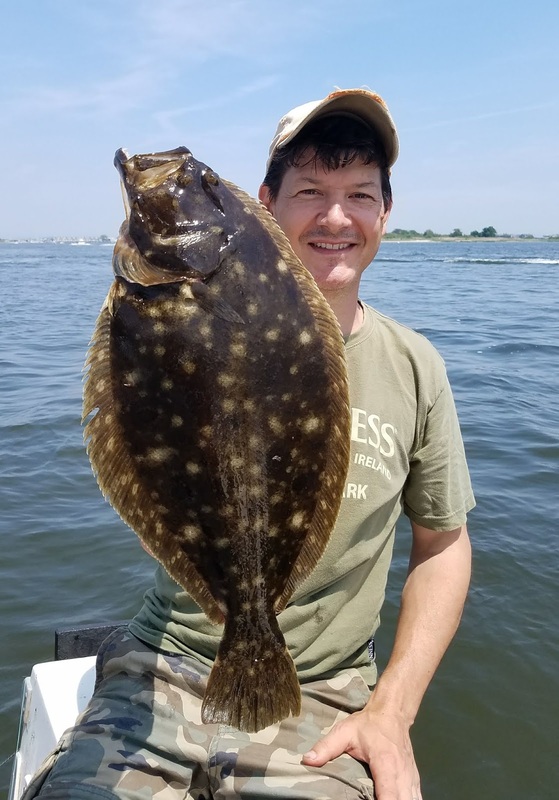 The weather was much better today and despite having low tide again, we slayed the fluke today! As soon as we got to our first spot we were hooked up within two minutes. The Wonder Rig (that I created) was unstoppable. One after another we just kept catching fluke - and big ones too. The kids had a blast and so did I. We caught out limit of three fish each and then spent the rest of the time throwing back fish that were good size. That was another benefit of taking the kids - more fish to legally keep at the end of the day. We ended our fishing when the tide got too low and we ran out of killies. I was amazed at the action today compared to yesterday. It just goes to show, you won't know if you don't go. When we got home I had to go pick Jamie up from work so I put all the fish into a cooler full of ice and let them chill for a while. I like to keep my fish on ice for 24 hours before cleaning - for a variety of reasons. Tonight was a scheduled poker night with the guys and I knew there was going to be some scavenger food there. I didn't go overboard but I did indulge in a little non-Survivor Worthy cuisine. Jersey Mike's Subs for example - and a few beers. What I really craved was the fluke that were sitting in my cooler. Tomorrow is another day and now that I have a bunch of nice fluke I will have no problem surviving for several more days.